Which current Michigan target will announce at “The Opening?” A 2015 QB named Michigan to his top 15 list; who was it? Did Michael Weber name a top four without Michigan? Which big time recruit will be visiting Ann Arbor this October? Find out in this Tuesdays version of The Future Huddle. Last week, I mentioned that 2015 TE Chris Clark had named a leader and wanted to commit soon. Well, Chris has made a decision in regards to the date he will announce. Chris will now announce his college decision at “The Nike Opening” this summer. As of this moment, I would say that Chris is Michigan’s to lose. He has had great visits while on campus and thinks highly of the program and coaching staff. Merritt is a 6’5 345 pound offensive tackle for his Archbishop Carroll (Washington, DC) high school team. With Merritt's size, he may be better suited to play on the interior of the offensive line. He holds offers from some pretty big named schools such as; Alabama, Auburn, Michigan State and Florida. Richards Hudl highlight tape can be viewed by clicking here. Yesterday, there was rumors floating around twitter that 2015 4 Star RB Michael Weber had announced a Top 4 list that didn't include Michigan. These are definitely rumors and Weber took to twitter to announce that he doesn't have a list at all. Brandon Brown from mgoblog spoke with Weber Tuesday morning to ask about the rumor and, he had some great news for Michigan fans. I also asked Mike Weber if #Michigan would be in his top group and he said, "no doubt". 2015 5 Star duel threat QB Torrance Gibson released his top 15 Monday via twitter. Michigan lands at #14, which really shouldn't be a surprise to anyone considering he doesn't even hold an offer. Gibson is an absolute highlight machine playing for American Heritage High school in Fort Lauderdale. I was more surprised that Ohio State was #4 on his list, than Michigan made the cut. Gibson has consistently been posting Ohio State things over twitter and, I expected them to be his second choice behind Tennessee. Gibson spoke with 24/7’s Ryan Bartow last night and this to say about Michigan being so low on his list. 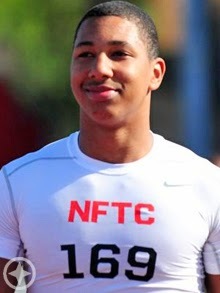 2015 5 Star Defensive End Keisean Lucier-South will be making an official visit to Michigan this October. Keisean named UCLA his early leader last week, but it looks as if he would like to see what Michigan has to offer. KLS will also try to get on campus this summer for an unofficial. Lucier-South in my opinion picked the best day of the season to visit. 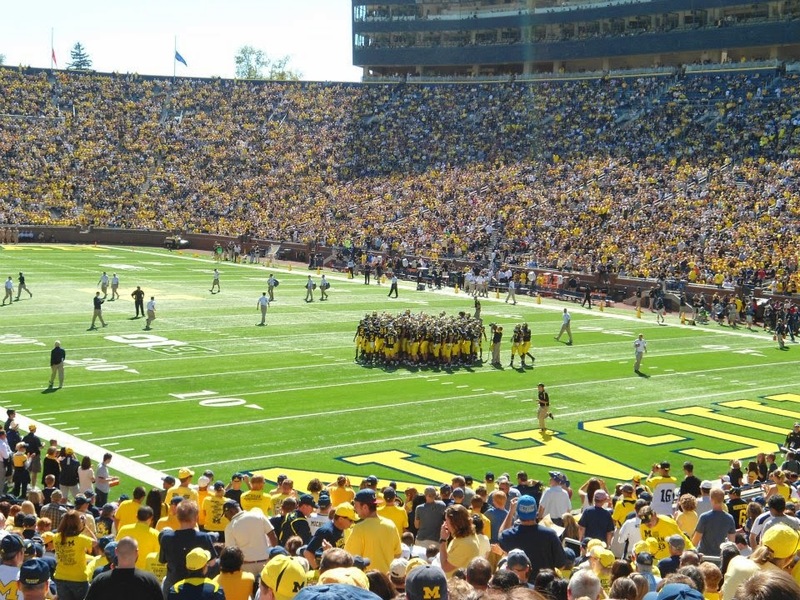 The weather in early October should be favorable, Ann Arbor will be electric for its third ever night game and, the game against Penn State should be one of the better games of the season. Keisean should be considered Michigan’s number one target at the moment. He was an absolute beast in his junior year of high school racking up 38 total tackles, 11 for loss, 10 sacks, forced 4 fumbles, and recovered two. His recruitment should come down to a battle of Michigan vs. UCLA. 2015 DE Darian Roseboro announced via twitter that he will be attending the Semper Fidelis All American bowl game in January. 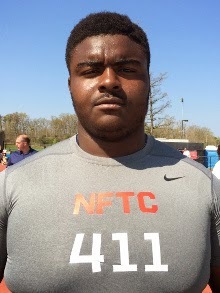 2015 Offensive Tackle Sterling Jenkins is going to announce his college decision tonight at 6:30. He holds a Michigan offer. My prediction? Jenkins will be the #14th commit in Penn States already impressive 2015 recruiting cycle. In last Friday’s version of The Future Huddle, I mentioned that newly offered 2015 offensive lineman Shane Lemieux would be visiting Oregon. Well, he committed while on his visit.